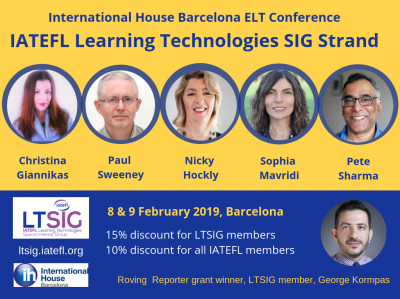 As part of our countdown to the International House Conference in Barcelona, which takes place on 8/9 February, this is the final post which focus on the speakers on the LTSIG strand. The IATEFL Business English SIG and IATEFL Leadership and Management SIG will also be there. The final featured speaker is current LTSIG coordinator, Sophia Mavridi. Are you an educator looking for exciting and student-centred ways to make your teaching more engaging? Do you want to use technology to speak to your students in a language they understand? Then come join this hands-on session and learn how filmmaking can encourage active learning and creativity in the language classroom. This session will argue that combining simple filmmaking tasks with language objectives not only offers opportunities for language learning but can also provide students with a clear, purposeful and creative goal to aim towards. Informed by current media literacy frameworks, we will explore how you can introduce filmmaking in the language classroom and how you can guide students through the process of planning, drafting, editing and revising short films. We will also look at a range of top tips to help you design in-class filmmaking projects and use them as an assessment tool. You do NOT need advanced digital skills or equipment to participate in the workshop; just bring in your creativity and your mobile device (smartphone or tablet) and…lights, camera, action! 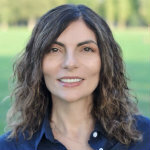 Sophia Mavridi is a teacher trainer, lecturer and researcher specialising in digital learning. She has been involved in ELT since 1998 as a primary & secondary EFL Teacher, Director of Studies, and more recently as an EAP and EdTech lecturer. She currently teaches at De Montfort University International College in Leicester, and also delivers learning technology courses, workshops and consultancy as a freelancer around the world. Sophia is the IATEFL Learning Technologies Co-ordinator, a special interest group focusing on the pedagogically sound application of technology to language teaching. She also writes reviews for the ELT Journal and works on research projects specialising in media literacies and digital ethics. Xerri, D. & Mavridi, S. (Eds) (Publication Date December 2018) English for 21st Century Skills. ELT Council & IATEFL Learning Technologies SIG. Floriana, Malta: ELT Council. Giannikas, C.N. & Mavridi, S. (Eds.) (Publication date: April 2019). Digital Innovations in Language Learning. Faversham, UK: IATEFL. Mavridi, S. (2014). Fostering Young Peoples’ Safe, Responsible and Ethical Uses of Digital Technologies: Teachers’ Perceptions and Pedagogical Considerations (Master’s Thesis). The University of Manchester, Faculty of Humanities: Manchester. Mavridi, S. (2014). Fostering Collaboration in and outside the EFL classroom. ELT News, Issue 299, p. 3. Mavridi, S. (2014). Moderating Class Blogs. The Belta Bulletin, 1 (1), p. 12-13. Mavridi, S. (2013). eSafety in the Classroom. TESOL Greece Newsletter, Issue May 2013, p. 22. The official programme for this event, showing all the speakers, is shown below. This can also be found on the official IH Barcelona site. You can enrol here and there are 10% discounts for IATEFL members and 15% discount for LTSIG members. To get this discount please use the discount code sent out to members in an email on 11 January.